Investor’s Business Daily posted a story today about an executive order issued by President Obama. This time, the president isn’t seeking to flood the country with tens of thousands of indigent, border-surging migrants in search of bigger benefits packages. Instead, he plans to award via executive order work permits to 100,000 foreign college grads (including deportable aliens) to compete with U.S. workers for jobs. Cui bono? Certainly not the U.S. workers he purports to champion. Obama’s Homeland Security rule, published in the Federal Register on Thursday, amounts to yet another illegal power grab by explicitly treading on Congress‘ constitutional prerogative to set immigration quotas. It also comes at a time when 94 million U.S. workers have been unemployed so long they’re no longer counted in labor-participation statistics. 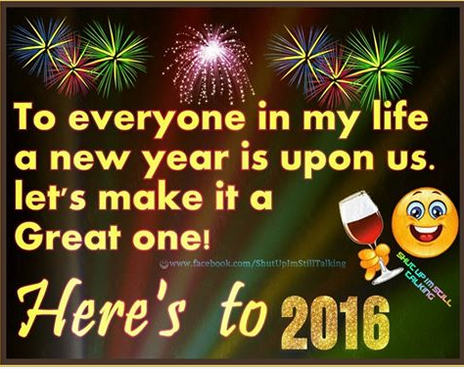 Some New Year’s Day present for millions of discouraged Americans. The move is especially nefarious not just because it stands as another example of executive overreach but also because foreign workers already have U.S. workers at a disadvantage. For one thing, they’re able to work cheaper. Unlike Americans, most have had free tuition rides from their sponsoring countries and carry no student loan debt. This enables them to tolerate lower wages than American grads saddled with high loan costs that can’t be shirked even in bankruptcy court. The foreign workers are also exempt from Obamacare rules that add to the employer cost of hiring workers. While liberal politicians complain about sending jobs oversees, they seem to have no problem bringing foreign workers here to take American jobs. It is time Congress put an end to these endless executive orders. It is time for Congress to develop a spine. Yesterday The Washington Times reported yesterday that the fire set at a Houston mosque on Christmas was set by a devout Muslim who attended the mosque. A man who was charged with setting fire to a Houston mosque on Christmas Day is a devout Muslim who said he worshipped there for years, authorities said Wednesday. Gary Nathaniel Moore, 37, of Houston, was arrested early Wednesday morning, and appeared in court 7 a.m. that day for the Dec. 25 fire. U.S. Bureau of Alcohol, Tobacco, Firearms and Explosives Special Agent Nicole Strong said they don’t know a motive but added there’s no evidence that it was a hate crime, The Associated Press reported. …According to court records, Mr. Moore was identified from surveillance video quickly walking away from the mosque at about 2:39 p.m. and smoke could be seen coming from the mosque about three minutes later, AP reported. …Despite Mr. Moore’s claim of being a member of the mosque, MJ Khan, president of the Islamic Society of Greater Houston, which operates the mosque, said he’s never heard of him. Whether encouraged by his local mosque or some other group, this was an attempt to show people that hate crimes against Muslims are a problem. 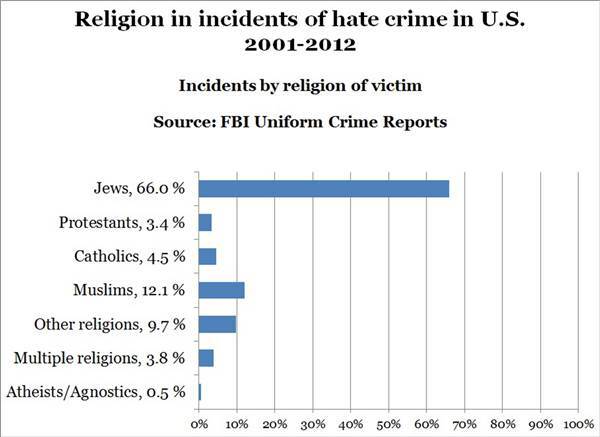 Hate crimes against anyone are a problem, but the majority of hate crimes in America are not directed at Muslims. The Wall Street Journal posted an editorial this morning about Hillary Clinton’s charges that Donald Trump is sexist. Excuse me for being cynical, but I suspect that if you questioned or listened to most men long enough, you could eventually find something to refer to as sexist. I wouldn’t use the word sexist to describe Donald Trump. I would be more inclined to use the words rude, crude, and blunt, and frankly, based on the persona he shows to the media, he is not someone I would be interested in hanging around with. However, that in itself does not disqualify him as a presidential candidate. The Wall Street Journal points out that Hillary needs to be careful when charging people with sexism and conducting a ‘war on women.’ Her closet does not lack skeletons in this area due to the escapades of her husband, Bill. Start with “bimbo eruptions,” the phrase that Mr. Clinton’s Arkansas fixer Betsey Wright used to describe the women who had affairs with Bill. Gennifer Flowers almost derailed his primary campaign in 1992, until Hillary stood by her man on CBS ’s “60 Minutes” and the media portrayed Ms. Flowers as a golddigger. The article also quotes James Carville‘s statement about Paula Jones, “If you drag a hundred-dollar bill through a trailer park, you never know what you’ll find.” Hardly an affirming statement. There were also the charges that Monica Lewinski was a stalker. There have been various reports on the internet about Hillary Clinton being fired from the Watergate investigation for unethical behavior. When I checked out these stories, I found contradictory information. However, World Net Daily posted a story in 2008 that seems to verify that there were some problems with Mrs. Clinton’s conduct during the investigation. I have no idea if the story is true, but it is telling that Mrs. Clinton’s actions often seem right on the edge of honesty and ethics. According to KPCC (Member of National Public Radio, operated by Pasadena City College), GVROs (gun violence restraining orders) “could be issued without prior knowledge of the person. In other words, a judge could issue the order without ever hearing from the person in question, if there are reasonable grounds to believe the person is a threat based on accounts from the family and police.” And since the order can be issued without the gun owner even being present to defend him or herself, confiscation can commence without any notice to the gun owner once the order is issued. California laws already ban people from owning guns if they have committed a violent crime or were involuntarily committed to a mental health facility. It seems odd than an additional law would be required. The potential for mischief under this new law is endless–a neighborhood spat, a divorce, a lover’s quarrel could all result in someone losing their guns without due process and also without any real reason. Hopefully, the first time anyone attempts to take away a legally owned gun without due process, there will be a massive lawsuit filed that will result in the law being declared unconstitutional, which I believe it is. Investor’s Business Daily posted an article today about the increased cigarette taxes in New York State. The state of New York thought it would reap a bonanza after increasing taxes on cigarettes. But there was no bonanza. In fact, the tax take actually fell. New Yorkers, may we introduce Art Laffer? 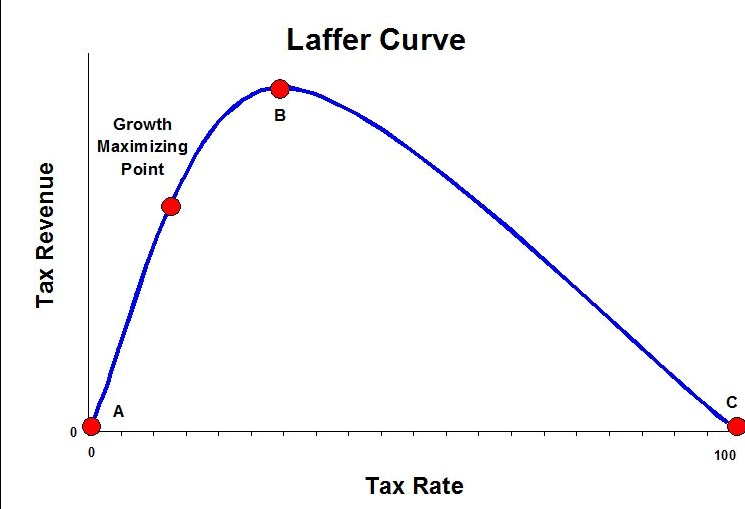 The Laffer Curve illustrates the relationship between tax rates and revenue, showing that increasing tax rates will only increase revenue up to a point. The New York Post cites a National Academies of Sciences, Engineering and Medicine report that says the state’s losses are much bigger — some $1.3 billion in taxes aren’t collected each year, due to behavioral changes. Of course, some of that loss might be considered favorable in that it represents people who simply quit rather than pay the higher levy. Indeed, estimates say that 19% of those who smoked have quit in the last decade. Taxable sales, however, are down 54% in the same period. If the goal of the higher tax was just to get some smokers to quit, then mission accomplished. But if the goal was twofold — get smokers to quit and raise revenue — then it has failed. But for many others who still smoke, the behavioral changes haven’t been as favorable. Some just pay up. But others simply buy black-market cigarettes, supplied mostly by organized crime. The Tax Foundation estimates that 58% of cigarettes in New York come from out of state. So roughly 6 in 10 cigarettes now are not taxed by New York. The article also points out that the year after the tax increase imposed, a household earning less than $30,000 a year spent 23.6% on cigarettes, as opposed to 11.6% in 2004. A family earning over $60,000 a year, spent 2.2% on cigarettes. Seems a little uneven to me. So is it any surprise that the tax take is shrinking? No. This was in fact entirely foreseeable. But, of course, foreseeing it would have required New York voters and the politicians they put into office to actually learn something about economics. Today’s Washington Examiner posted a story about a Congressional request for the documents related to ethics office discussions with the Clinton Foundation and both Clintons about speech fee disclosures made since Dec. 2008, when Clinton struck a deal with the White House just before becoming secretary of state. The article explains that the deal imposed stricter reporting requirements on Bill Clinton and the family’s foundation given Hillary Clinton’s impending position as the nation’s chief diplomat. Rep. Jason Chaffetz pressed the Office of Government Ethics last week for an explanation of its decision to exempt Clinton from laws compelling public officials to disclose all forms of income. “Earlier this year, press reports indicated that former Secretary of State Hillary Clinton and her husband failed to disclose millions of dollars in paid speeches over the past thirteen years under the belief they did not have a duty to report that because the speeches were delivered on behalf of the Clinton Foundation, and not in the Secretary’s or the President’s personal capacity,” Chaffetz wrote. The Utah Republican cited “at least five speeches” for which Clinton routed her speaking fee to the philanthropy between 2014 and 2015. She did not list that income on her disclosure form as the law typically requires. Bill and Hillary Clinton have amassed a tremendous amount of money since leaving the White House. A lot of that money has been channeled through the Clinton Foundation, which the Charity Navigator refused to rate because its “atypical business model . . . doesn’t meet our criteria.” The Federalist posted an article in April pointing out that the Clinton Foundation actually spends approximately 10 percent of its donations on charity. It is time to examine closely the Clinton Foundation and the Clintons’ sources of income. Hopefully, Congress will not be blocked in this investigation. Herman Cain posted an article in the Canada Free Press today about Donald Trump’s presidential campaign. In the article, Mr. Cain explains why conservatives are supporting Donald Trump despite the fact that he is not a politician with a conservative record. The reasons are actually quite simple. But here’s what a lot of conservatives see when they look at the big picture: The proper and appropriate people who pass judgment on Trump’s comportment have given us $19 trillion in debt, and offer “solutions” like 10-year plans that might (but probably won’t) reduce the amount added to the debt by $1 trillion or so over 10 years. These same people have given us 12 million illegal immigrants living among us because they have refused to enforce current laws, and refuse to either start enforcing those laws or take new border security steps to ensure the problem will not get even worse. These same people have given us a leviathan of a tax code so complicated that we Americans spend billions of dollars each year just trying to understand it – and that’s before we pay the taxes. These same people think they’ve accomplished something grand when they manage to pass a spending bill that doesn’t shut down the government. That’s a pretty low bar, wouldn’t you say? The fact that Trump shows no respect for any of this is not a negative in the minds of people who want to see these problems solved. They correctly perceive Washington’s political culture long ago stopped being serious about really solving these problems, and they’re tired of being lectured about how politics is the “art of the possible.” If the things that would actually work are impossible in the current political culture, the solution is not to conform to that culture. It’s to blow it up. As I have previously explained, I am not a supporter of Donald Trump. However, I will gladly vote for him if he is the Republican nominee for President. It is time to elect a President who is not part of the Washington establishment and will not be pushed around by the Washington establishment. That would be either Donald Trump or Ted Cruz. I don’t see anyone else I could support. During a National Security Council meeting held at the Pentagon on Dec. 14, President Barack Obama told top military officials and other officials he wanted to see a better job of having the so-called “narrative” of the war on ISIS communicated to the American people, a senior defense official told CNN. Communication is not the problem. “They think they can defeat US and UK ground troops, who they say they have no experience in city guerrilla or terrorist strategies,” he told Jewish News. “But they know the Israelis are very tough as far as fighting against guerrillas and terrorists. This doesn’t sound as if we are making progress in the War on Terror. I have mentioned more than once in this blog that the gun culture of the south is unfamiliar to me. I am rapidly coming to the point where I will apply for a gun permit and get a concealed carry permit. My husband is already there. I don’t like the idea of having to defend myself with a gun, but unfortunately there are people walking around in America who do not respect the property and lives of their fellow Americans. There were four stories cited in the past week that show the need for average citizens to be prepared to defend themselves. Today The Daily Caller posted an article citing these stories. The first story deals with two men trying to buy a car on Craigslist. When the men arrived to see the car, the man who met them pulled out a gun. One of the men trying to buy the car shot the man in self defense. Had the man wanting to buy the car not been armed, the story would have had a very different ending. The next story involved an armed robbery attempt of a seafood market in Florida. The seafood market employee pulled out a gun and shot the robber. In Detroit a man attempted to use pepper spray on a dog that attacked his dog. When the pepper spray had no effect, he shot the dog, saving his dog and possibly himself from injury. The final story involved a man in Georgia. 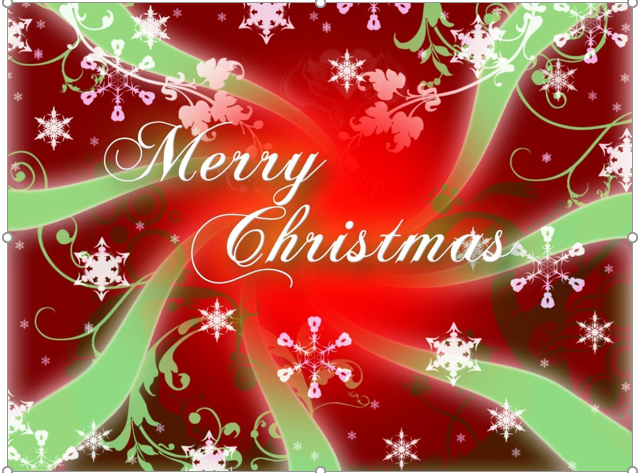 On Christmas night Antonio Bagley shot a man who attempted to rob him. Had not Mr. Bagley carried a concealed gun, the story would have had a different ending. Most of us have grown up in a world where we depended on the police to keep us safe. The police do a good job, but they cannot be everywhere at once. Americans have to take responsibility for their own safety. I don’t like this, but I suspect it is where we are and where we will be for at least a while. American Military News reported on Wednesday that the U.S. government suppressed information on chemical weapons found in Iraq. The U.S. government suppressed information about chemical weapons it found in Iraq, and several servicemembers were injured by their exposure to those weapons, The New York Times is reporting. In an article published late Tuesday, the newspaper says it found 17 American servicemembers and seven Iraqi police officers who were exposed to mustard or nerve agents after 2003. They were reportedly given inadequate care and told not to talk about what happened. According to new reports from the New York Times, between 2003 and 2011 U.S. troops were exposed to Chemical weapons in Iraq regularly, and on 6 occasions were injured by them. All in all 5,000 chemical warheads were found in Iraq dating back to the Saddam Hussein regime. Many of these warheads were made in close conjunction with western nations. I don’t mention this to bring it up as an excuse for the invasion of Iraq. I bring it up to remind people that our government has not always been truthful with us. As far as the invasion of Iraq is concerned, we need to remember the situation at the time–the Iraqi government was violating a United Nations no-fly zone and other conditions of the United Nations agreement signed after Iraq invaded Kuwait. If we wanted the United Nations to survive, we had to deal with Iraq. I personally would not miss the United Nations, but that was the situation at the time. We also need to remember that the Democratic party supported the invasion of Iraq at the beginning and later used the war as a political issue. The war in Iraq is another example of politicians interfering in ways that are unhelpful in military situations. Andrew McCarthy posted an article at the National Review today that should cause us all to stop and think for a moment. In America, we hear a lot of things from the media, and as Americans we tend to accept what we have been told. However, some of what we have been told is patently ridiculous. He reminds us that he was the prosecutor of the“Blind Sheikh,” Omar Abdel Rahman after the bombing of the World Trade Center in 1993. After asking the question above, Mr. McCarthy points out that when the American media and American presidents refer to Islam as ‘a religion of peace,’ they are overlooking some very obvious points. At trial, the jihadists tried to tell the jury they were just moderate, peace-loving Muslims who had been provoked by American foreign policy, a perception of anti-Muslim bias, and videos of Muslims being persecuted in Bosnia. The Blind Sheikh insisted his incitements to jihad were simply a case of faithfully applying sharia principles, which, according to his lawyers, the First Amendment gave him the right to do. So I asked the jury a simple question: Is there any obnoxious, insulting, infuriating thing I could say to you, or show to you, that would convince you to join up with mass-murdering terrorists? To become a terrorist yourself? Of course, a dozen commonsense New Yorkers did not need to be asked such a question. They laughed the defense out of the courtroom. Alas, in the 20 years since, the defense they laughed out of the courtroom has become the bipartisan government policy of the United States. We have forgotten the lessons of history. Top Right News posted a story today about the wonderfully warm weather we are having this Christmas. I never thought weather would get political, but that’s where we are now. Science advocate Bill Nye explained on Tuesday that many parts of the United States were expected to see record temperatures over the Christmas holiday because of weather patterns associated with climate change. Christmas Eve 1955 was much warmer. Three fourths of the country was over 60 degrees, and Ashland Kansas, Geary Oklahoma and Encinal Texas were all over 90 degrees. Fort Lauderdale was 85 degrees. All of the stations below were over 60 degrees on Christmas Eve, 1955. The article at Top Right News notes that in 1955 the greenhouse gases were 80 percent lower than in 2015. So what caused the warm temperatures then? I suspect that most Americans are big fans of the Internal Revenue Service (IRS). They are something of a necessary evil in sorting out the complex set of lobbyists’ rules that make up our tax code. The have been politicized under President Obama and that may continue under the next President. The last thing we need to do is give them more power, but that is what is happening. Investor’s Business Daily reported yesterday that the massive transportation bill that a Republican Congress passed this month gives the Internal Revenue Service new powers to authorize the State Department to revoke U.S. passports. Doesn’t that make you feel secure? But beware: Beginning next year, those living in states that haven’t upgraded their state IDs as federally mandated may need passports to fly domestically. So if the IRS has an issue with you, you may find yourself kept off the jet that was supposed to take you to spend Thanksgiving with your folks. That has changed. 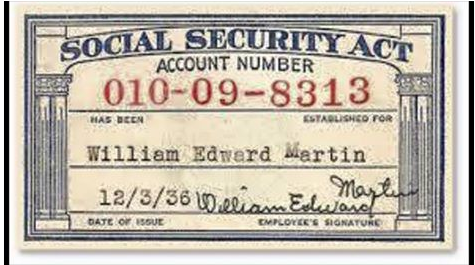 This new rule could well be called “The IRS Wall,” and its express purpose is “to keep our people in” — that is, until they’ve emptied their pockets to the satisfaction of Uncle Sam. IRS power was already disturbing. Last year, the proprietor of a small, cash-only Mexican restaurant in Iowa, a woman not charged with any crime or suspected of cheating on taxes, saw tens of thousands of dollars seized from her checking account by the IRS without a warrant, just because she made frequent small deposits. It is time to remind those in Washington that the U.S. Constitution was designed to curtain the power of government–not the freedom of Americans. The U.K. Daily Mail posted a story yesterday (and updated it today) about a Muslim man who was planning to go to Disneyland with his family, but was stopped from boarding his flight and his visa to America revoked. It seems that there was a Facebook page set up by someone who lived as his address claiming links to Al Qaeda and the Taliban. He said: ‘It is not my son’s Facebook page. It has a similar name, but not the same as my son’s. But it is now believed that Mr Mahmood’s wife was in Pakistan at the time. It has also been suggested the move by US authorities could be due to Mr Mahmood’s brother having been refused entry to Israel eight years ago, but no official explanation has been given by the US Embassy. Obviously, I have no way of knowing if the man is actually linked to terrorism or not, but I would rather inconvenience one family than let a terrorist into America. If the Facebook page was a joke done by Mr. Mohmood’s son, it was a joke done in extremely bad taste. It was also a joke that had unintended consequences. I am sorry for the disappointment that this family experienced, but considering the contents of the Facebook page, I don’t think they should have been allowed to come to America until that was explained. Scott Johnson posted an article at Power Line today about the Black Lives Matter protest at the Mall of America in Minneapolis. The protest was handed very well. Thugs indeed, but the story at the Mall of America turned out to be heartwarming. The mall was well prepared for the demonstrators, who got nowhere. Mall police cleared the East rotunda, where the demonstration was to take place, of shoppers. Stores were temporarily closed. When the demonstrators arrived, the mall was briefly locked down. Police wasted no time in clearing the demonstrators. They ordered the demonstrators out; most complied, apparently, and those who didn’t were shepherded out with only a few arrests. Protest is a First Amendment right, but disrupting commerce is not. Thankfully the Mall handled the protesters well and sent them on their way. Black lives do matter, but so do all lives. The majority of murders in the black community are done by other blacks–not by policemen. Policemen are simply trying to protect the innocent. There would be fewer blacks killed by police if the black community would discourage stealing and other criminal activity within its own community. The Daily Caller is reporting today that on Tuesday a federal judge ruled that Utah can stop funding Planned Parenthood clinics in the state. Republican Gov. Gary Herbert ordered the state to cut off the money flow after the Center for Medical Progress released a series of videos earlier this year that brought to light Planned Parenthood’s dealings in aborted fetuses. Top Planned Parenthood doctors talk frankly about harvesting aborted fetuses, and clinic staff are seen picking through abortion remains in the videos. The article points out that the Utah clinics do not sell fetuses to researchers, but are affiliated with clinics that do. The videos that came out about Planned Parenthood were horrifying. I honestly do not understand how anyone could watch them and still support Planned Parenthood. Personally, I do not oppose abortion in cases where the life of the mother is in danger, but that is such a small number of cases, the procedure could be done in hospitals. It is unfortunate that killing babies has become a million dollar industry. Investor’s Business Daily posted an article about what has happened to student loans under the Obama Administration. The Obama Administration took over the student loan program in 2010. In a nutshell, federal loan aid to colleges is pushing up tuition faster than inflation. Students must take out ever higher amounts of debt to pay for their education, but starting salaries haven’t kept up. If students don’t get good jobs when they graduate, many will default. The study, published by the National Bureau of Economic Research, shows conclusively that growth in one program — the Federal Student Loan Program — was more than enough to account for the entire rise in college tuition from 1987 to 2010 — a stunning conclusion that suggests a massive market failure. From 2006 to today, total student loan debt soared from $517 billion to $1.3 trillion, a 152% jump, to cover surging tuition costs. Over that same period, real starting wages for college grads were essentially flat. Sadly, this should be no surprise, given recent history. At some point, we need to realize that the private sector does a better job at everything than the government. The bubble of the student loan debt will be bailed out by the taxpayers, and the national debt will continue to spiral out of control. This is our future unless we begin to elect people who understand both human nature and free markets. The Washington Times reported today that Franklin Graham has left the Republican Party. He left the party after the omnibus spending bill was passed. The bill continues the government funding of Planned Parenthood and was passed with both Republican and Democratic votes. I totally understand his decision. I have remained in the Republican party in the hope that at some point they will return to the pro-life stand stated in their platform. I don’t see the possibility of having a strong voice in Washington without being associated with either the Republican or Democratic parties. That is unfortunate and has gotten us into the mess we are in, but I believe it is where we are. I hope Reverend Graham will continue to speak out for the principles that made America great. America is a Representative Republic. We send people to Congress to represent us. Some do a good job, and some simply forget who elected them. A website called The Pulse 2016 posted an article yesterday about the Every Student Succeeds Act (ESSA) that just passed Congress. The article includes a number of quotes from Arne Duncan, current Education Secretary. …We had many, many conversations behind the scenes . . . . And I said for us to support it, they’d have to shed their far, far right [i.e., constituents who support the Constitution and oppose Common Core] . . . . I honestly didn’t know if they’d have the political courage to do that. But they both said they would and they did. I give them tremendous credit for that. …About a month before [final Senate passage of the bill], I ran into Speaker [Paul] Ryan and we just talked briefly. I asked if he was going to back this, whether he’s willing to take on the far right. I just asked him straight up. And he said, “Absolutely. We’re going to back this.” And, he did. That’s when I thought it had a real shot. …We were intentionally quiet on the bill – they asked us specifically not to praise it – and to let it get through. And so we went into radio silence and then talked about it after the fact. . . . Our goal was to get this bill passed – intentionally silent on the many, many good aspects of the bill . . . [W]e were very strategically quiet on good stuff . . . .
…The final thing is we have every ability to implement, to regulate the law . . . it’s just a Washington typical storyline. . . . And candidly, our lawyers are much smarter than many of the folks who were working on this bill. There are some face-saving things you give up, some talking points you give up, which we always do because we’re focused on substance. And we have every ability to implement. That’s all I’ve ever wanted. Unless more Americans begin to pay attention, we will lose it.